NTSE Uttar Pradesh 2019 - State Council for Educational Research and Training (SCERT), Uttar Pradesh, has released the NTSE UP result 2019 on February 28, 2019, in the online mode. The Council conducted NTSE Uttar Pradesh 2019 on November 4, 2018, for class 10 students from recognized schools from the state of Uttar Pradesh. The NTSE 2019 admit card was handed over to students by the school authority after October 22, 2018. The offline application process concluded on September 26, 2018. NTSE Uttar Pradesh is the first stage of NTSE 2019 exam. Students who qualify NTSE Uttar Pradesh 2019 will be eligible to participate in the second stage of the exam from the state. National Council of Educational Research and Training will conduct NTSE stage 2, 2019 on June 16, 2019. To know more about the NTSE Uttar Pradesh 2019 exam, result, merit list, cutoff, application process and more, read the complete article below. Reservation - 27% reservation for OBC or Other Backward Classes has been included this year. This will be in accordance with the central norms regarding the income limit of 8 lakhs notified by the Government of India. Duration of Exam - NTSE stage 1 exams will be conducted for a duration of 4 hours, where, MAT and SAT will be conducted in separate sessions of 120 minutes each. Examination Pattern - Language test has been removed from the NTSE 2019 exam. Only Mental Ability Test and Scholastic Ability Test will be conducted in the examination. Scholarship - NCERT revised the number of NTSE scholarship so due to this the state quota of the scholarship will also increase and the revised list for UP will also be published. Students can check the results for NTSE Uttar Pradesh 2019 declared on February 28, 2019. SCERT, Uttar Pradesh has released a merit list of students qualified in NTSE Uttar Pradesh 2019. The result PDF contains MAT, SAT, and merit scores of selected participant. These selected students will participate in NTSE stage 2, 2019 on June 16, 2019. The applicant must be a student of class 10 of the academic year 2018-19. Only students from government recognized schools can apply. Students who appeared for class 10 boards in 2018 cannot apply. Open or distance learning students can apply for the exam given that they are not above 18 years in age, and are not employed. Application forms for Uttar Pradesh NTSE 2019 were available at the district wise exam centres decided by SCERT. Students could submit the completely filled NTSE Uttar Pradesh application form for NTSE Uttar Pradesh by September 26, 2018. Admit card/ hall ticket form were also to be attached within the application form. How to Apply for NTSE Uttar Pradesh 2019? Step 1 - Collect the application form at the specified exam centre in the respective district. Step 2 - Fill the required details and paste passport size photographs wherever it is asked. Step 3 - Applicants from reserved categories (ST, SC, OBC, PH) were required to attach a copy of their reservation/ disability certificate attested by a gazetted officer. Those who fail to attach their reservation/ disability certificates will have to take the exam under the ‘general’ category. Step 4- Exam fee payment: Students were required to attach a bank pay slip of Rs. 50/- for general category, and Rs. 30/- for reserved categories with the application form. The bank pay slip should be payable to Secretary Examination Regulatory Authority, U.P. Allahabad. Properly filled application forms with all the required documents attested and attached had to be submitted at the exam centre of the district candidate studies in. The admit card/ hall ticket of NTSE Uttar Pradesh 2019 were made available with the state’s liaison officer for NTSE 2019. Applicants could collect their admit card/ hall ticket from their school officials after October 22, 2018. Those preparing for NTSE Uttar Pradesh must go through the exam pattern, syllabus, and sample papers to successfully qualify the exam. Preparing with these materials give students a thorough understanding of what to expect in the exam paper. Following sections cover the exam pattern, syllabus, and sample papers of NTSE Uttar Pradesh to help candidates with their preparation. There is no prescribed syllabus for NTSE stage 1 examination. Information on the two tests, MAT and SAT, is made available in a PDF file by NCERT. PDF contains the following information on the tests. However, students can follow syllabus prescribed by leading coaching institutes for coaching. Find NTSE Uttar Pradesh 2019 syllabus by FIIT-JEE in the following table. Fundamental Principal of Counting; Data Inequality. Atoms & Molecules and Mole Concept. The MAT for NTSE Uttar Pradesh 2019 is designed to test logical reasoning, problem-solving skills of each candidate. The test contains questions on verbal reasoning and non-verbal reasoning. Verbal reasoning test may contain questions on analytic reasoning, arithmetic reasoning, blood relations, coding-decoding, direct sense test, fill in the blanks, word sequencing, questions on direction, word problems, clock problems, series completion test, truth verification etc. Non-verbal reasoning test may have questions on analogy, analytic reasoning, dot fixing situation, classification, embedded figures, folding/ cutting paper, complete the figures, mirror images and more. 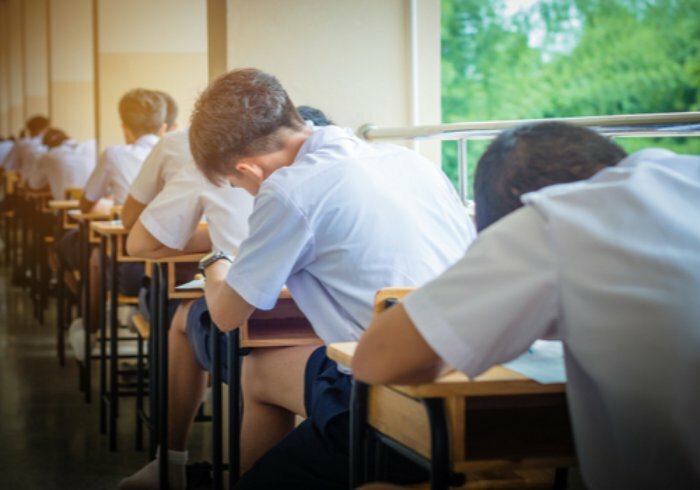 The Scholastic Ability Test or SAT is aimed at testing factual knowledge gained by the participants in Mathematics, Science, and Social Science in their school education. To study for the SAT, students should study using their class 10 syllabus for the three subjects. For 2019, NTSE Uttar Pradesh exam had Mental Ability Test and Scholastic Ability Test. Both tests consist of 100 questions each, and each question is for 1 mark. MAT and SAT are conducted in two separate sessions for 120 minutes each. For more details on the exam pattern of NTSE Uttar Pradesh 2019, have a look at the table below. 100 questions worth 1 mark each. Sample papers and previous years’ question paper of NTSE Uttar Pradesh are available online. NTSE Uttar Pradesh sample papers are key preparation materials to qualify the exam. Students who consistently practice with these study material develop a familiarity with the exam pattern, the time duration, and the types of questions asked in the exam etc. The answer key of NTSE Uttar Pradesh 2019 has been released by SCERT, Uttar Pradesh and leading coaching institutes. The NTSE UP answer key consists of the correct answers to the questions asked in the exam. Candidates can compare their answers with those in the answer key and calculate the probable NTSE stage 1 score. Under the NTSE programme, 2000 scholarships are distributed each year by the national conducting body NCERT. Students selected through Stage 1 of NTSE Uttar Pradesh 2019 will compete for 2000 scholarship at stage 2 of NTSE 2019. What is the total marks of ntse 2019 Madhya pradesh. Hello Rajvardhan,Total marks of ntse 2019 madhya pradesh is 100.Thanku. Is it 100% sure that new revised result will be released for NTSE MP 2018-19 . When will revised results of NTSE MP be announced or declared ?? Your NTSE brochure has been successfully mailed to your registered email id .